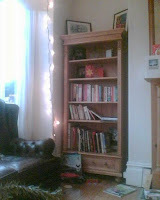 A new bookcase and several new tomes to get through, courtesy of Santa and Rachel. Here are ten books that have been important to me. To Kill a Mockingbird is one of my favourites. I grew up in an American mountain community fifty years on from Mockingbird...but it was still small enough and secluded enough to be very similar. And it moves me every time.